As I'm sure I've mentioned on this blog before, I love breakfast. Save for oatmeal there aren't many breakfast dishes I dislike, but eggs in almost any form rank right at the top of the list, often in sandwich form. So, it was some surprise to me a month or so ago when I was contemplating a bacon'n'cheese sandwich a realised I didn't really want one. I wanted all the components of it, for sure, but not in the way I ususally constructed and consumed it. I took a minute to think about it and began deconstructing the sandwich: eggs, cheese, bread. Simple. How could I reconfigure these in an equally delicious way, that sounded more appealing than the old-standby? Thankfully the answer struck me within a minute or two, and it was so obvious that I couldn't believe I'd never thought of it before. Take the egg out of the sandwich, use the cheese and bread to make grilled cheese, fry the egg over easy, dip the grilled cheese in the lovely, runny yolk, then enjoy some fried egg and grilled cheese. Simple, delicious, and absolutely satisfying, especially when doused with a little hot sauce. 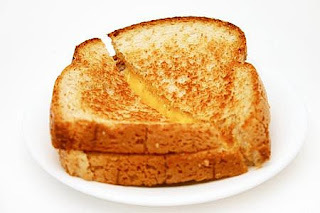 I'll assume the average reader has grilled at least one cheese in his/her life so I'll skip that, but if you've only got one decent pan to your name I like to pop my grilled cheese in a 250 degree oven for a minute or two while I fry the eggs. Now, the only hitch is making a proper over easy egg, which I finally, after years of broken and over cooked yolks, discovered the secret to: a well oiled, screaming hot frying pan, non-stick if you got it. Crack the eggs into the hot pan and allow them to cook until they're set just enough to flip them. Once they've reached this stage quickly, but carefully, flip the egg and kill the heat. The pan is certainly hot enough to cook the top of the whites and lightly seal the yolk without totally cooking it. Let them sit this way just long enough to pull the the grilled cheese, then halve the sandwich and plate. Again, hot sauce is a nice addition, but completely optional. I think provolone and/or Swiss make for great grilled cheese, but Muenster and/or pepper jack are excellent, too. And a few strips of bacon couldn't hurt either right? And if one were to fry the grilled cheese and eggs in the rendered bacon fat, that wouldn't be too terrible either, right? Right.